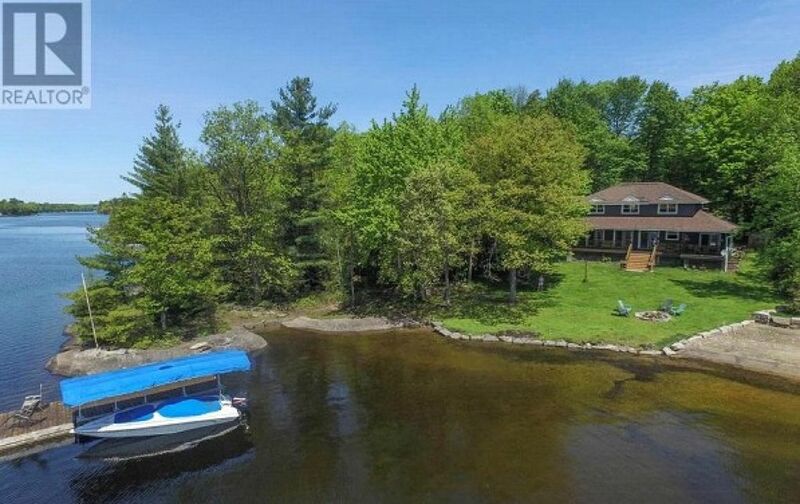 Beautiful 5 bedroom family owned cottage has 365 ft. water frontage. Located a short walk from Bala and a short drive from Gravenhurst - 1 3/4 hrs from Toronto. Clean, private and quiet. Great views of the lake from cottage and deck. BBQ is available and a filled propane tank is included. Three seasons room available and large kitchen area with large table for everyone to enjoy meals. Outdoor Hot tub available for relaxing evenings. The living room, kitchen and dining area is open concept with a propane stove. Basement is great for entertaining and large groups. Basement has a wood burning fireplace and wet bar. The cottage is fully insulated. Bathrooms have a walk in tiled shower, toilet and sink. We rented Adam's cottage to celebrate my husband's 60th birthday. We were there with 8 adults and two children. There was plenty of space for all of us and we really enjoyed ourselves. The cottage is clean and well equipped for whatever you might need. The area is beautiful and we enjoyed quiet walks in beautiful Bala. The hot tub and games in the rec room were great for a winter weekend. A welcome card and bottle of wine was a nice touch. Thank you! Beautiful property in quiet Bala! We had a lovely time spending the weekend in Bala. The cottage was perfect for our family. It had everything we needed. We spent time playing pool, walking, had a campfire outside and enjoyed the hot tub. I would highly recommend staying here if you have a larger family gathering. Judy B. Easily one of the most beautiful cottages we have been to. Impeccably clean, had every possible amenity/supply we could need. Very well appointed. We visited in the winter and had no need to worry about any potential weather-related issues. We had so much fun at this cottage and the well preparedness of the hosts made us feel at ease immediately. Lakeview was incredibly beautiful. Spent our nights enjoying the firepit, drinking hot chocolates and using the hot tub. Cooked meals in the large kitchen (with so many supplies!) and love the big dining table. The basement was an absolute treat, as well as modern amenities including the oven, soundbar, TVs and superbly performing thermostat! Would definitely love to return here. Amazing Cottage with a beautiful view! We had a wonderful time at Adam &amp;amp; Jason's cottage! The cottage was spacious, clean and had more than what we needed. The basement games were a huge hit and we spent a lot of time there. Something to keep in mind is that we were required to send a $2,000 e-transfer a few days before booking as a damage deposit but that was returned to us a couple days after we checked out. It was an amazing weekend and can't wait to return - hopefully in the summer next time so we can enjoy the water and outdoor property!